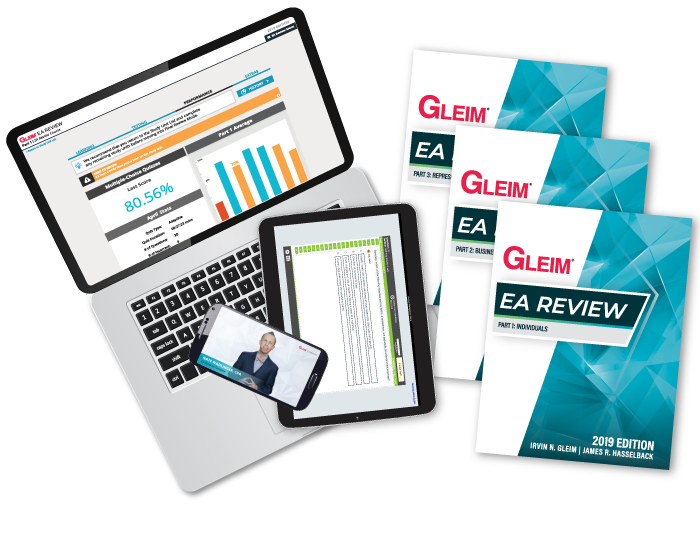 Try the Gleim Premium EA Review Course for free and receive 12 months of unlimited access to an entire study unit for Parts 1, 2, and 3. Largest test bank of EA exam questionsThis innovative online question bank enables you to practice under realistic testing conditions with unlimited exam-emulating Practice Exams and to improve your understanding with detailed answer explanations. Online ReviewThe online course is your main study tool in this guided, self-study review. Gleim EA Review Course includes your interactive study planner, exam-emulating quizzes, the Gleim digital books, and Audio Lectures. Audio LecturesYou can review the most important concepts of the Gleim books on the go by streaming or downloading our Audio Lectures. These flexible study tools encourage auditory learning and maximize study convenience. EA Exam-emulating platformYou will feel right at home when you sit for the EA exam as we have developed our platform to be the most realistic emulation of the Prometric testing environment.